Home / BDS / ISISrael / Israel / Palestine / Terrorism / WarCrimes / Zionism / Watch: The Israeli sniper asked Palestinian young man: Where do you want to be shot? Watch: The Israeli sniper asked Palestinian young man: Where do you want to be shot? Four rounds of sniper fire hit Mohammed Amassi, a young Palestinian baker standing on the roof of his home in the Al-Fawwar refugee camp. As he tries now to recover from his wounds, he still remembers the mocking words of the soldier who shot him. Why waste words when the video from the Palestinian news agency Ma’an shows pretty much everything? Israeli soldiers are on the roof of the next-door apartment building: One is on the lower roof, two on the balcony of the apartment above the roof, and two more are looking out from the apartment window. A few teenage girls and children are looking at them from the neighboring roof. Total silence. Suddenly, the two soldiers on the balcony raise their hands, as though giving a signal, and one of them, the sniper, aims and starts shooting. On the roof of the building, Mohammed Amassi is hit. He falls to the ground and starts crawling for his life, bent on getting off the roof. Finally, a medical team gets him down via a ladder. The only thing Amassi is holding is his cell phone. Nothing about him could have seemed threatening to the soldiers on the roof opposite, about 80 meters (260 feet) away. The sniper took aim and fired, hitting him with round after round. The palm of one hand is covered with blood; he is writhing in pain, stunned. A few weeks later, Amassi, 22, is in his living room, lying on a new adjustable bed that has been loaned to him by a Palestinian charity. He’s a good-looking young man, smiling and quiet. His family’s home is well kept, compared to others in Al-Fawwar — a hardscrabble refugee camp, the most southerly in the West Bank and the one that most closely resembles the refugee camps of the Gaza Strip, which isn’t all that far from here. On August 16, a huge Israel Defense Forces raiding party, consisting of hundreds of soldiers, swooped into Al-Fawwar in the dead of night. In less than 24 hours, they killed one person and wounded dozens more. Their haul: two old pistols. The local residents are convinced the raid was nothing more than a training exercise carried out at their expense. We arrived at Al-Fawwar on the eve of Id al-Adha (the feast of the sacrifice). In the butcher shop, a cow was being sliced up for the holiday. Those who can afford meat congregated around the animal, waiting for their portion. The IOF rarely carries out raids in this crowded camp, where about 10,000 people live in an area of one square kilometer. The troops haven’t returned since the raid. Amassi is the son of the camp’s baker, Ibrahim Amassi, and the eldest of six siblings. Their family bakery was the first in Al-Fawwar, dating from the foundation of the refugee camp in the early 1950s. In recent years, it’s produced mainly pretzels, cookies and special doughs for traditional dishes. Mohammed studied interior design, but afterward became a baker to help provide for the family. He works two shifts a day, morning and afternoon, seven days a week. He has never been arrested or even been interrogated by Israeli authorities. Above the living room in which he is now recovering, another apartment is being built: he will live there when he marries and has a family of his own. His hand is bandaged, and both legs are marked with wounds and scars from the shooting and subsequent surgery. Bedridden, Amassi continues to suffer from intense pain. It’s not clear whether he will be able either to walk again or to use his hand. At the moment, he can only hobble around with the aid of crutches. On the day of the big raid last month, his younger siblings woke him at 6:30 A.M., three hours after the soldiers entered the camp. The troops were scouring the alleys and seizing control of buildings. At first, the camp’s inhabitants thought the soldiers had come to demolish the home of Mohammed al-Shobaki, who was killed in alleged stabbing attack . However, it soon became apparent that the troops had other intentions, though it was not clear what they were. The whole camp was up on rooftops, watching the show, and Amassi was no exception. His house has two roofs: one, with a low rail, where people sit on hot summer nights; and above it an unfenced roof, for the water tank and satellite dish. Amassi climbed onto the upper roof to get a better view. It’s dangerous there: Without the fence, there’s no place to take cover. Teams from Ma’an and the television channel Palestine Today were positioned on the roof of the adjacent building, which offers better protection from the soldiers. Clashes were taking place between soldiers and stone throwers on the camp’s main street, but quiet prevailed here, on the high hill where this neighborhood stands. The troops seized quite a few houses — about 30, according to Musa Abu Hashhash, a field researcher for the Israeli human rights organization B’Tselem — and carried out searches in about 200 homes, smashing holes in some walls for snipers. At about 9 A.M., Amassi was talking to the reporters on the next-door roof. Suddenly he heard a soldier who was deployed on the balcony of the building below his call to him in Arabic: “Where do you want to get it?” Amassi was petrified. He knew what this meant: In which part of your body do you want to be shot? According to Amassi, there was nothing to account for the soldier’s chilling question. The street was quiet, and Mohammed had done nothing that could be construed as a threat to the troops, who were 80 meters away as the crow flies. His father, Ibrahim, believes the soldiers shot his son in order to demonstrate their power to the camera crews on the roof next door. Amassi then tried to find shelter on an exposed roof that has no shelter. He could have fallen off. In the edited Ma’an video, he’s seen crawling desperately. A flimsy, makeshift iron ladder — which I was afraid to climb — is the only way to gain access the upper roof. Somehow, the paramedics got him down. They carried him by foot for about 150 meters up the narrow alley to their ambulance, which took a soldier-bypass route to get him to Al-Ahli Hospital in nearby Hebron. Amassi was semiconscious. Damage had been done to blood vessels. 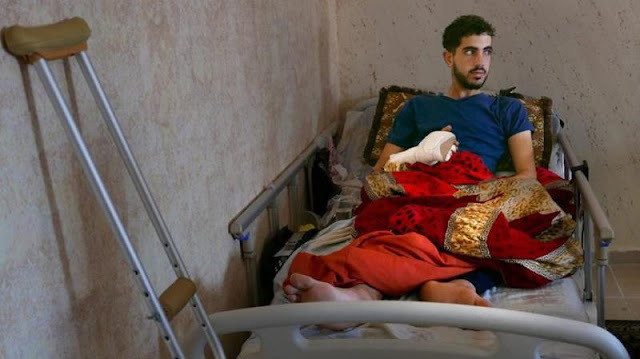 To avoid having to amputate his leg, he was moved to Hebron’s other hospital, Alia. But they, too, did not have the necessary specialist. That evening, he was transferred to the Ramallah Government Hospital, where he underwent surgery. Amassi spent 10 days in the Ramallah hospital. One bullet remains lodged deep inside, somewhere between his waist and hip and left thigh, and the physicians aren’t sure they will be able to remove it. If not, he will probably have to undergo additional surgery in Jordan. Next to his bed is a plastic jar containing the two bullet fragments that were successfully extracted from his body. He’s taking five different types of painkillers to try to relieve the suffering. We leave him and go up to the roof. There are tangled iron rods where he fell. A few hours after he was shot, troops killed Mohammed Abu Hashhash, 19, who was shot the instant he stepped out of his house, a few hundred meters away, on another street. The soldiers opened fire through a breach they made in the wall of a neighboring house. That breach, together with a painting of the dead teenager on the wall, constitute a monument to a young man whose killing was probably as unnecessary as the shooting of the young baker in Al-Fawwar. there is evidence that lady diana was killed because she showed interest in the plight of the palestine people. just as prince harry has shown interest in her work on landmines will he now show interest in this.